How did you score tickets to "The Men Tell All"? One of my friends knows one of the show's producers. As soon as I found this out, I immediately called in the most important favor I could imagine ever asking of him. In the front row directly behind [host] Chris Harrison and the hot seat. It was just a fluke we got those seats: I brought a friend [another fellow superfan] and we were one of the last people called into the theater. They needed a party of two for the front row and we fit the bill. What's the difference between seeing it in person and seeing it on TV? Surprisingly, it was eeerily similarly because the set was so utterly familiar, like we had teleported through our TV into the studio. Everything looked exactly the same: the lighting, the flowers, the candles and, of course, the roses. Are the guys better (or worse) looking in person? So much better-looking in person. We were actually floored by how good-looking they were. They were shorter than we expected, however -- at least some of them were. They were all very comfortable and charismatic on stage. Clearly, they had been in front of cameras for months. None of them seemed shy or embarrassed to be there. Were there any surprises with the guys? I have to admit, I have been a little bit lax in my viewing this season: I have an infant, so I've been watching with one eye, so I didn't know exactly who the guys were. So when they came out, I was like "That guy is cute." But he turned out to be the potentially racist one, so I quickly changed my crush. Ron was very charming and super cute. 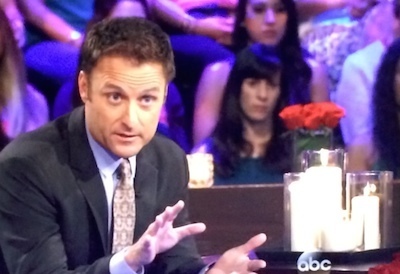 What was Chris Harrison like? He's more sarcastic and hilarious than he is on the show. On the show he has to appeal to a mainstream American audience, but in reality he's very wry and quick-witted, so that surprised me a bit. And what was Andi like? Very likable. And so much more beautiful in person -- she truly is stunningly gorgoeus, as good-looking as any A-list celelbrity. Articulate and very put together. She came across as genuine. What?!? Really? Start to finish? Really, eight hours. When we first got there, we were in a holding room while the producers were making sure everyone was there. They gave us sandwiches. Then they ushered us into the studio and we spent the first two hours watching the fantasy suites episode -- they tape "The Men Tell All" before the fantasy suites episode airs so we got to see it before anyone else. After that, each segment took a long time to shoot because they film more than they air, and there were breaks between each segment for leg-stretching and bathroom runs. Luxury trailers set up like nice hotel restrooms. An entire trailer was one bathroom. 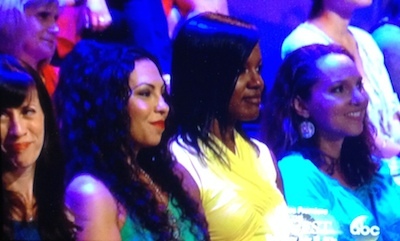 I was looking around at my fellow audience members, like, "Who are these people? How did they get here?" There were a lot of jewel-toned tops. It really did look exactly like the audience you see on TV. They're a combination of people like me who are friends of friends, people who had won charity contests, randos off the street and people associated with the show. For instance, there was a guy there -- and there are hardly any guys in the audience -- so I asked him how he got there and he said he provides the limos for the show. But I have to say, everybody in that audience was a superfan -- there was not one jaded person in the room. I've been in the studio audience of Dancing with the Stars -- I was there to interview Lisa Vanderpump -- and I was seated next to another interviewer who was totally bored. 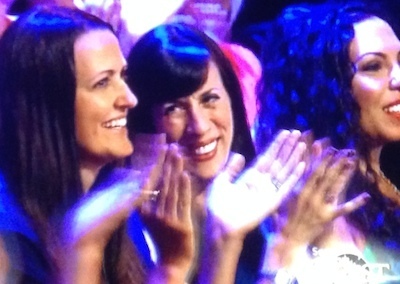 At the "Men Tell All," everyone -- and I mean everyone -- was laughing it up. Did you practice your reaction faces beforehand? My friend and I were cracking up practicing our faces beforehand, but when the show started, we were so caught up in it, we really were making crazy expressions. Afterwards, we were actually afraid we might look really ugly because we hadn't practiced looking pretty while looking surprised! Did they use any of your reaction shots? Umm, nothing BUT shots of us! We were practically in every frame! 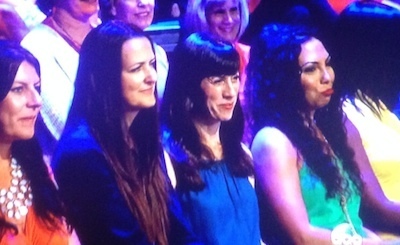 [See below, Laurie is the one in blue, with dark brown glossy bangs.] There were no super-surprised reaction shots but we did tsk tsk when Chris Harrison talked about Marquel getting kicked off. At one point, Chris brought up a rumor that Andi was pregnant, but I misheard and thought she was about to announce that she actually was preggers, so I whipped my head around to my friend and gasped louder than I've ever gasped in my life. Fortunately, they didn't use that. What was the most surprising thing about the experience? It was more intimate than I thought it would be. There's nowhere to hide. You really are a part of the show. And the guys were very close to the audience. They were only a few feet away. They were milling about afterwards and we could have interacted with them, but there were a lot of producers around and I think it would have been unseemly to try to talk to them. Any other dirt you can give us? There are a ton of funny things that I'd like to share but they might really break the fourth wall and I had to sign an extremely steep confidentially agreement that no amount of fundraisers would ever help me recoup.